Coconut oil is one of my favourites. I have coarse curly hair which just loves natural nourishment. It is good for skin, hair and insides. I use it as a hair conditioner. 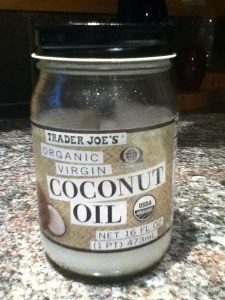 It’s very rich so you can melt it and let it down by adding an almond oil – so it goes on more easily. That said, on curly hair the fact it is hard at room temperature gives you better curls. As a body butter you can let it sink in or you can put just a touch on after a shower to keep your skin happy. It’s quite alkaline which can be good to complement your diet if it’s very acidic. Last year I made Christmas cakes with coconut oil rather than butter. This greatly pleased a chef friend who didn’t usually get to eat Christmas cake – coconut oil is one of the only ones he can have due to a health issue. Along with all it’s benefits it’s also relatively cheap. The photo above is just for inspiration, choose any coconut oil that is 100% coconut oil and nothing added, and favour organic to help the environment as well as yourself.